As the popularity of the internet increases, it is becoming more and more important for businesses, both small and large, to have a strong internet presence. Years ago it would cost hundreds if not thousands of dollars to create a professional looking website. Today, it’s much more affordable, and can be done without the help of a professional. 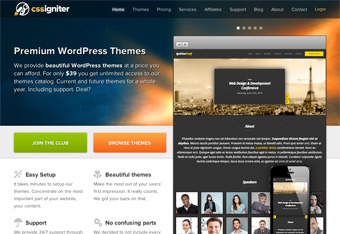 All you need to do is purchase a WordPress theme from a developer like CSSIgniter. CSSIgniter, also known as CSS Igniter, is a professional web development firm that specializes in WordPress themes and templates. They use excellent designers to produce beautiful themes. All of their themes are super easy to set up, and can literally be installed in a matter of minutes. Even if you are not familiar with WordPress, it shouldn’t take you more than an hour or two to set up a nice website with the help of CSSIgniter. To make things easier, this particular developer has eliminated many of the superfluous settings and options that many developers include, essentially streamlining the design and website building process to its simplest form. CSSIgniter designs themes for a number of niches, and they also have several different WordPress restaurant templates to choose from. One unique thing about this company is that they operate more like a club than a typical retail business. You pay a one-time payment, and you get access to ALL of their themes and templates! Plus, CSSIgniter has excellent customer support, available 24/7 through a members-only online forum, where you can get help from developers and fellow webmasters alike. So whether you’re looking for a slick new WordPress restaurant template or a simple blog theme, you’re sure to find what you’re looking for at CSSIgniter. Plus, with their 24/7 support, you have nothing to worry about – there will always be someone there to help if you run into any issues!